The wedding cake may be the sweetest symbol of a wedding celebration, but in ancient times the custom was slightly different. Wheat, symbolizing fertility, was baked into cakes, which were given to all of the guests to throw at the bride. This tradition continues today only in the form of throwing rice, birdseed or confetti at the newly married couple. When brides and grooms cut their wedding cake together, they’re sharing matrimonial sweetness in the same way couples have done for centuries. In the recent past, traditional wedding cakes have consisted of plain white cake heavily decorated with white icing and topped with a plastic replica of a bride and groom, nowadays that is very retro. While tradition is always good, it’s a new millennium after all so your cake can also reflect a unique statement of your individuality. 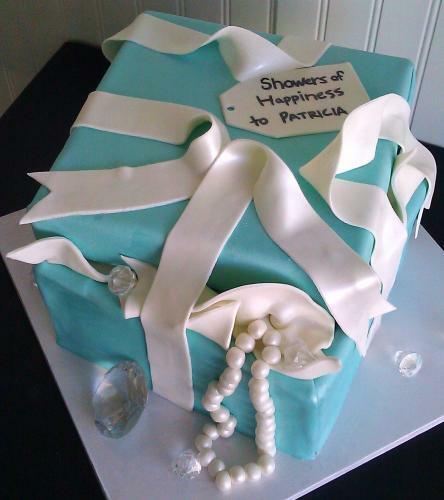 The first step in creating your grand finale is to find an excellent pastry chef or bakery specializing in cakes. This should be done six to eight months before your wedding day. 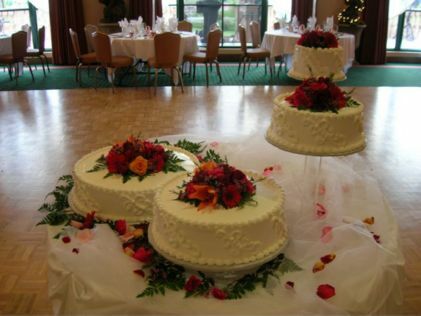 Some caterers also offer wedding cakes, and using their services is often the easiest option. Be sure and ask your caterer if this service is provided. As you begin your search for the ultimate wedding cake, expect to see creations you never imagined: cakes resembling beautifully decorated hat boxes or wrapped gifts, sweet layers supported by sleek, glass pillars or “Alice in Wonderland” tilted layers in bright colors. You will see cakes so beautiful that it almost seems a shame to cut them. Not to be overlooked is your cake top. That famous pair, the plastic bride and groom, have been replaced nowadays by the fun and whimsical or the elegant and personalized cake top. Almost anything goes, from blown glass to porcelain figurines painted and dressed in the likeness of the bride and groom, to ornaments depicting a couple’s occupations or hobbies. If you’re more traditional, fresh flowers echoing those used throughout the wedding are also a good choice. As in every other aspect of the wedding, the cake top should reflect the personality of the couple it represents. 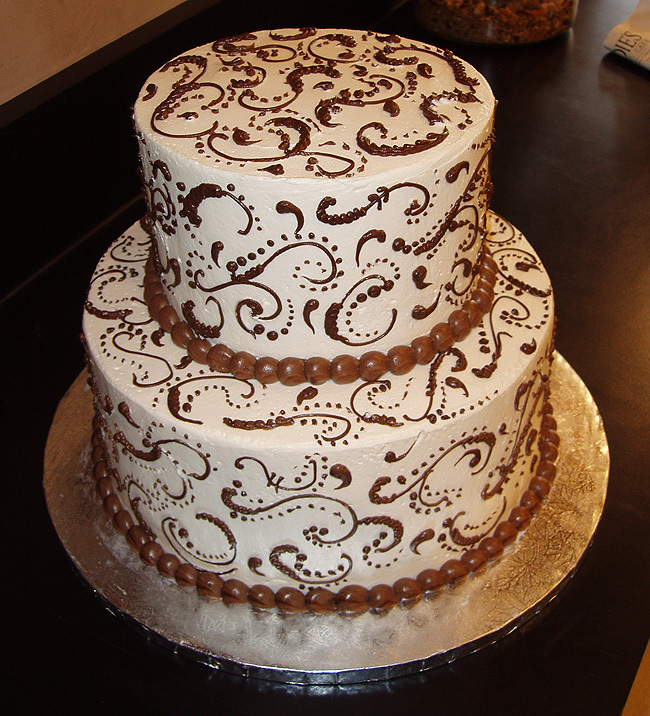 Your idea of a great cake design and your baker’s ideas may differ. When you meet with your baker it is a good idea to have clippings from magazines or books highlighting some of your favorite cake designs. Describe the degree of formality, estimated number of guests and the colors and flowers for your wedding. If you have already finalized, or at least have an idea of your menu, share this information with your baker so you don’t duplicate flavors. (Do you really want lemon chicken followed by lemon wedding cake?) Most bakers have portfolios depicting a wide variety of cakes and will provide you with a list of references. Keep in mind that the cake is priced separately from the rest of the menu. The cost is quoted at a per-person per-serving rate, and prices will generally range from $1.50 to $6.50 per slice depending on your choice of ingredients and the complexity of the decorations. 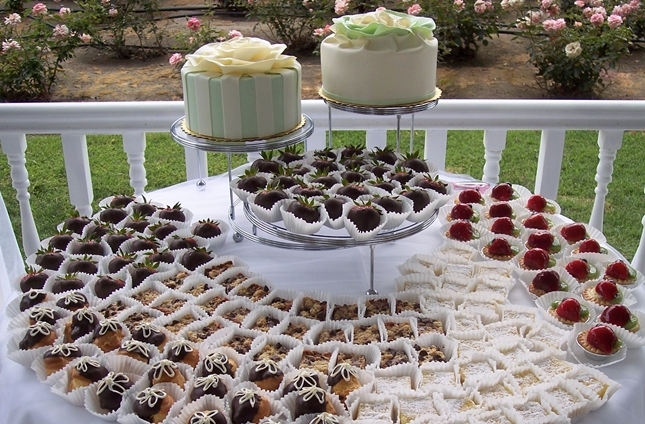 If cost is an issue, consider having a smaller decorated wedding cake accompanied by sheet cakes of the same flavor. The taste will be the same, but the price will be lower. If you plan on observing the age-old tradition of saving the top layer for your first anniversary, be sure the number of servings does not include the top. If you don’t relish the taste of slightly stale cake, consider having a small version of your wedding cake baked fresh for your first anniversary. Once you have made your selection, the baker will set up a tasting where you will also finalize the details of your cake selection in writing. Your contract should describe the specifics of the cake including filling and icing flavors, colors, decorations, cake top, number of servings, delivery date, time, location and set-up details. Confirm that all services are included in the final contract price. Usually a deposit of 50 percent is required, and the final head count is due no later than five days before the wedding. Be sure to give your baker the name and number of a contact person at the reception site. It is the baker’s responsibility to find out exactly when the facility will be open for the cake’s delivery, if refrigeration is available if needed, and the general logistics of setting up the cake. Also, make sure that a separate table is set aside and decorated to display the cake. Most likely your baker will provide tips for you and your new groom to accomplish the time-honored task of cutting the cake with ease. Plan ahead to have your cake knife and lifter decorated with ribbons or fresh flowers. As tradition has it, the bride grasps the knife with the right hand and the groom encloses her hand with his. Together, the couple plunges the knife into this ancient symbol of prosperity and fertility. In the case of a formal sit-down dinner, you might opt to serve a simple dessert at the end of the meal, usually ice cream or a light sorbet rather than cake. In this scenario the cake is cut some time after the traditional first dance. Because of the previous dessert you should opt for smaller cake portions, which may make the cake cost less. If this is your plan, let your baker know. An additional cost, for which you should be prepared and that is unrelated to your baker, is the plating charge or caterer’s fee for serving the cake. The charges vary from $.50 to $1.50 per person, though in some instances this fee is negotiable. The first impression your guests will have of your wedding is when they open the heavy, starched envelope containing your invitation. They will immediately form an impression of the ceremony to come, so selecting the invitation–the paper, the style, the wording–is an important first step in your wedding plans. Experienced stationers are your best advisors on wedding invitations and their knowledge is available at no charge when you purchase your invitations in their store. Stationers can also provide helpful hints on when to order and mail the invitations, how to determine proper postage budgeting and a myriad of other details. Take time to select your invitations. Feel the paper samples. What impression do they give? Understated elegance? Fun? Whimsical? Romantic? Wedding invitations do much more than simply request the presence of the addressee. The stationery is typically comprised of several components, each with a different purpose. There is the ceremony card, the reception card (if applicable), the response card with its stamped return envelope, the map (if one is to be included) and the inner and outer envelopes. Formal invitations are typically engraved on the first page of a double sheet of heavy paper, folded once or on card stock. The paper color is typically ivory or white with black ink, although charcoal gray ink is also acceptable. Paper size is either 5-1/2 x 7-1/2 (folded once, as described) for the embassy size, or 4-1/2 x 6-1/4 (also folded once) for the classic size. The paper is usually devoid of design: the rare exception when the bride’s father’s family has a coat of arms. One subtle way to distinguish your invitations is to select an unusual paper stock such as rice, linen or parchment and textures such as weave and moiré. You can even choose an unusual handmade paper with pressed flower petals or small leaves. The three basic printing techniques are engraving, embossing and thermograph. Engraving, used for very formal invitations, lettering is brought into relief by impressing from behind. More costly than other options, this process can take up to eight weeks. Embossing raises the lettering, artwork and borders from the surface without the use of ink. Thermograph, a very popular and cost effective technique, resembles engraving on the front, but without the tell-tale impressions engraving leaves on the back of the paper. Order your invitations three to six months prior to the wedding date, allowing ample time for reading and correcting the proofs, printing, addressing and mailing. Order enough invitations for each couple, family, or individual on your final list, each attendant and their guests, and the clergy. Then add at least 25 percent to the total number. Unless your budget is unlimited, you probably won’t be able to have absolutely everyone you’d like to invite however, you do want to have as many as you can. Start by making an “A” list, composed of family and friends you must invite, and a “B” list of those you would like to invite, but whose absence you can accept. Usually about 25 percent of invitees will be unable to attend, giving you some leeway. When you receive a regret from someone on the A list, send an invitation to someone on the B list. the letters RSVP at the bottom left corner of the reception card will show that you expect confirmation or regret. A formal wedding invitation includes an inner and an outer envelope. The inner envelope holds the invitation itself and the enclosure(s), with the ceremony invitation on the bottom, the reception card in the middle, then the response card and the map, if any, on top. If your invitations are folded twice, the enclosures are inserted in the second fold. All of these items are then inserted into the inner envelope face up with the folded edge down. The inner envelope is addressed to the person, couple or family, using neither first names nor street address, just “Mr. and Mrs. Green.” However, if children are included in the invitation, write their first names on a second line, “Michael and Erinn.” Insert the addressed and stuffed inner envelope into the outer envelope with the addressee’s name facing the back flap so it will be visible upon opening. Street names, cities and states should be written out completely without abbreviations. When addressing envelopes by hand, use blue, blue-black, black or charcoal-gray ink. You may consider hiring a professional hand-calligrapher or paying for computer-generated calligraphy for your envelopes. Invitations should be mailed four to six weeks before the wedding, three weeks before at the latest. Mail them earlier if many of your guests are traveling a considerable distance or if the wedding is on a holiday to allow time for travel arrangements. Weigh the complete invitation to ensure correct postage, and confirm whether the envelope is considered standard or oversized by the United States Post Office. To get into the spirit of our upcoming bridal show (Sunday, August 21st from 10:00-4:00) and getting a chance to spend some quality time with our Brides-To-Be, Premier Bride decided to have a little fun. We invited our friends Clayton Clark from KMPH26, Oh So Swank, Sweet Dreams Cakes and Flowers, and FresnoDJ.com to join the party and we held a Cake Dive Live and Wedding Feud event! We put out the invitation to our Facebook friends looking for adventurous brides-to-be and we received a wonderful response. We drew names to find our contestants and Chelsea , Brandi and Alyssa were our lucky brides! Click on the link below to view the taped segment. As you can see we had a lot of fun! Special thanks to our wedding vendor partners who donated the prize packages. After handing out the prizes, we moved onto our next game-Wedding Feud! Our brides-to-be Chelsea and Megan went head to head (with help from our lovely Premier Bride’s Perfect Dress staff) in a heated wedding feud. Click on the link below to view the action! Although Chelsea’s team gave it their best, Megan’s team ultimately won the challenge. Megan won the Flemings Steak House Prize. Both brides received tickets to the Sunday, August 21st Premier Bride Showplace. Overall we had a great morning & we thank all of our vendor partners and brides-to-be who participated. See you at the show! Special thanks to Clayton Clark of KMPH26 for being an AMAZING game show host. Thank you to Amber for being our beautiful bridal Vanna. Photos provided by Anne Driscoll of Build Media Marketing. 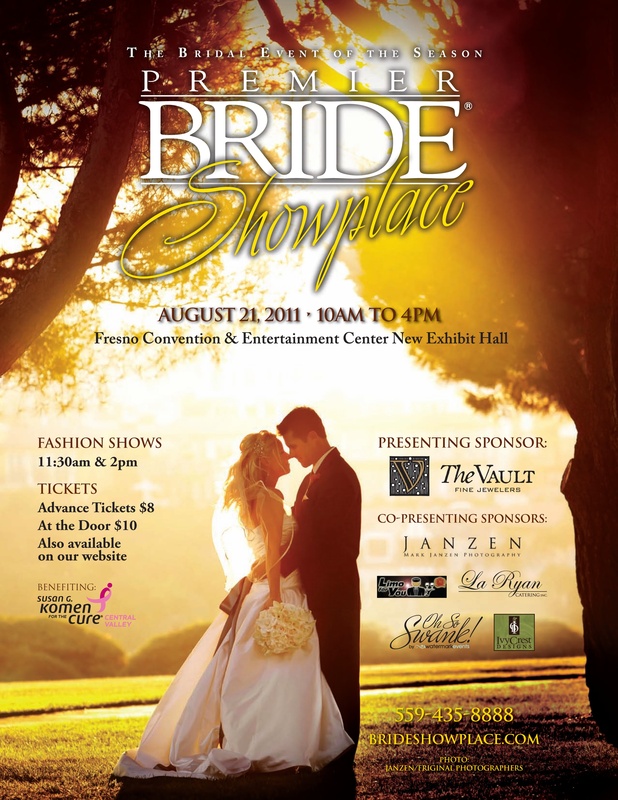 It’s that time of year again- Premier Bride’s Showplace Bridal Show. This year our show is being presented by The Vault and co-presented by Mark Janzen Photography, Limo for You, La Ryan Signature Events, Oh So Swank, and Sweet Dreams Cakery. For a list of our exhibitors, please click here. To pre-purchase tickets on-line, please click here.